In this study the regulation of macrophage expression of cyclooxygenase-2 (COX-2) in response to dsRNA and virus infection was examined. Treatment of RAW 264.7 macrophages with dsRNA results in COX-2 mRNA accumulation and protein expression and the production of PGE2. Similar to dsRNA, encephalomyocarditis virus (EMCV) infection of RAW 264.7 cells stimulates COX-2 expression and PGE2 accumulation. The dsRNA-dependent protein kinase (PKR), which has been shown to participate in the regulation of gene expression in response to dsRNA and virus infection, does not appear to participate in the regulation of COX-2 expression by macrophages. Expression of dominant negative mutants of PKR in RAW 264.7 cells fails to attenuate dsRNA- and EMCV-induced COX-2 expression or PGE2 production. Furthermore, dsRNA and EMCV stimulate COX-2 expression and PGE2 accumulation to similar levels in macrophages isolated from wild-type and PKR-deficient mice. Recently, a novel PKR-independent role for the calcium-independent phospholipase A2 (iPLA2) in the regulation of inducible NO synthase expression by macrophages in response to virus infection has been identified. The selective iPLA2 suicide substrate inhibitor bromoenol lactone prevents dsRNA- and EMCV-stimulated inducible NO synthase expression; however, bromoenol lactone does not attenuate dsRNA- or EMCV-induced COX-2 expression by macrophages. In contrast, inhibition of NF-κB activation prevents dsRNA-stimulated COX-2 expression and PGE2 accumulation by macrophages. These findings indicate that virus infection and treatment with dsRNA stimulate COX-2 expression by a mechanism that requires the activation of NF-κB and that is independent of PKR or iPLA2 activation. The dsRNA-dependent protein kinase (PKR)3 is a serine-threonine kinase that plays a primary role in regulating the antiviral activities of infected cells (1, 2, 3). PKR contains two dsRNA binding motifs in the NH2-terminal domain, and dsRNA binding results in PKR dimerization, autophosphorylation, and activation (4). PKR is activated by dsRNA formed during viral replication or by viral RNA containing extended double-stranded secondary structure (2, 3, 5, 6, 7). Synthetic dsRNA (polyinosinic-polycytidylic acid (poly IC)) also activates PKR, and treatment with poly IC stimulates an antiviral response similar to that observed following virus infection (1, 5). In an activated state PKR plays a central role in the regulation of transcription and translation. The phosphorylation of serine 51 of the eukaryotic translation initiation factor eIF2α by PKR results in the suppression of protein synthesis (8). PKR also participates in the activation of a number of transcription factors, including NF-κB and IFN regulatory factor-1 (IRF-1) as well as in the expression of proinflammatory genes, including inducible NO synthase (iNOS), IL-1, and IL-6 (1, 9, 10). In unstimulated cells NF-κB is sequestered in the cytoplasm by the inhibitory protein IκB. Following stimulation by proinflammatory cytokines, dsRNA, or viral infection, IκB is phosphorylated, ubiquitinated, and targeted for degradation by the 26S proteasome (11, 12). In vitro studies have shown that PKR has the ability to phosphorylate IκB (13), and dsRNA- and virus-stimulated NF-κB nuclear localization and DNA binding activities are attenuated in fibroblast cell lines deficient in PKR (13, 14, 15). The mechanism by which PKR stimulates NF-κB activation is associated with the activation of IκB kinase (IKK). PKR appears to be capable of activating IKK through protein-protein interactions, as wild-type PKR overexpression stimulates IKK activity, and catalytically inactive PKR expressed at high levels also results in IKK activation (16, 17, 18, 19). While PKR has been implicated in the activation of NF-κB, a PKR-independent pathway activated by dsRNA and virus infection that results in NF-κB activation and the subsequent expression of genes in an NF-κB-dependent manner has recently been identified. Double-stranded RNA and encephalomyocarditis virus (EMCV) infection of PKR-deficient mouse embryonic fibroblasts results in IκB degradation, NF-κB nuclear localization, and DNA binding as well as NF-κB promoter activation (20). Peritoneal macrophages and islets of Langerhans isolated from PKR−/− mice do not display defects in the ability of dsRNA to activate NF-κB (9, 21). In RAW 264.7 macrophages, the stable expression of dominant negative (dn) PKR does not modulate the ability of dsRNA to stimulate IκB degradation or NF-κB nuclear localization and DNA binding; however, dnPKR does attenuate dsRNA-stimulated iNOS expression (9). Importantly, the PKR-dependentexpression of iNOS by dnPKR-expressing RAW 264.7 cells can be overcome by IFN-γ (9). In naive peritoneal macrophages, which require two proinflammatory signals to stimulate iNOS expression (22), the presence of functional PKR is not required for dsRNA- and IFN-γ-induced iNOS expression or NO production (9). Similar to iNOS, macrophages isolated from PKR−/− and PKR+/+ mice express and release equivalent levels of IL-1 in response to dsRNA (9). These findings suggest that the role of PKR in the regulation of NF-κB and proinflammatory cytokine expression may be cell type specific. In RAW 264.7 macrophages, PKR appears to regulate iNOS expression by a yet to be identified pathway, as PKR is not required for dsRNA-induced NF-κB activation (9). IRF-1 is one transcription factor whose activation is essential for iNOS expression by macrophages (23), and PKR appears to regulate IRF-1 expression (1); however, dsRNA stimulates IRF-1 expression to similar levels in macrophages and islets isolated from PKR−/− and PKR+/+ mice (24). In an effort to elucidate PKR-independent signaling pathways that regulate inflammatory gene expression by macrophages, we recently identified a novel phospholipid-signaling cascade that participates in the regulation of iNOS expression by macrophages in response to dsRNA and EMCV infection. Bromoenol lactone (BEL), a selective suicide substrate inhibitor of the calcium-independent phospholipase A2 (iPLA2) (25) attenuates dsRNA-, dsRNA- plus IFN-γ-, and EMCV-induced iNOS mRNA accumulation, protein expression, and production of NO by RAW 264.7 cells and primary mouse macrophages (26). While BEL inhibits iNOS expression, it does not modulate dsRNA-stimulated NF-κB activation or IL-1 expression and release. The molecular mechanism by which iPLA2 participates in the regulation of dsRNA-stimulated iNOS expression appears to be associated with the release of a lysophospholipid that is capable of activating PKA and subsequently activating CREB. These findings have identified a signaling role for iPLA2 in the PKR-independent regulation of iNOS expression by macrophages following virus infection. In this report the roles of iPLA2 and PKR in the regulation of cyclooxygenase-2 (COX-2) expression by macrophages were examined. COX catalyzes the oxidation of arachidonic acid, producing PGH2, which is then isomerized to biologically active eicosanoids and thromboxanes (27). Of the isoforms of COX, COX-2 expression is stimulated under inflammatory conditions (28). Virus infection has been shown to stimulate COX-2 expression (29, 30, 31, 32), and inhibitors of COX-2 enzymatic activity attenuate virus replication (33, 34), suggesting that the expression of COX-2 and the increased production of PGs may play an important role in viral replication. In addition, we and others have shown that under proinflammatory conditions the expression of COX-2 and iNOS appear to be coordinately regulated (35, 36, 37, 38). Using macrophages isolated from PKR−/− mice and overexpression of dnPKR, we show that the presence of functional PKR is not required for dsRNA- and EMCV-induced COX-2 expression by macrophages. While the iPLA2 inhibitor BEL prevents dsRNA- and EMCV-induced iNOS expression (26), BEL does not attenuate macrophage expression of COX-2 under similar conditions. In contrast, inhibition of NF-κB activation prevents the stimulatory effects of dsRNA and EMCV infection on COX-2 expression and PGE2 production by macrophages. These findings suggest that viral infection stimulates the expression of COX-2 and the production of inflammatory PGs by an NF-κB-dependent and PKR- and iPLA2-independent mechanism. DMEM containing 10% heat-inactivated FCS and l-glutamine was obtained from Washington University Tissue Culture Support Center (St. Louis, MO). CMRL-1066 tissue culture medium, l-glutamine, penicillin, streptomycin, lipofectin, and geneticin G418 were obtained from Life Technologies (Grand Island, NY). Poly IC was purchased from Sigma-Aldrich (St. Louis, MO) and was prepared for use as previously described (9). [α-32P]dCTP and ECL reagents were purchased from Amersham Pharmacia Biotech (Piscataway, NJ). The pDEST26 mammalian expression vector was purchased from Stratagene (La Jolla, CA). HRP-conjugated donkey anti-rabbit IgG was purchased from Jackson ImmunoResearch Laboratories (West Grove, PA). Rabbit antiserum specific for the C-terminal 27 aa of mouse macrophage iNOS was a gift from Dr. T. Misko (Amersham Pharmacia Biotech, St. Louis, MO). The PKR−/− mice (C57BL/6 J × 129/SV background) were a gift from Dr. R. Kaufman and have been previously described (4, 15). C57BL/6J wild-type mice were purchased from Harlan (Indianapolis, IN). COX-2 cDNA and rabbit anti-COX-2 antiserum were obtained from Cayman Chemicals (Ann Arbor, MI). All other reagents were obtained from commercially available sources. For these studies, RAW 264.7 cells stably expressing the dominant negative PKR mutant K296P (RAW-PKR-M1.1) and a second line expressing the empty vector pDEST26 (RAW-pDEST26) were generated by lipofectin transfection using methods previously described (9). In brief, RAW 264.7 cells were plated at 2 × 105 cells/3 ml of complete CMRL-1066 (CMRL-1066 containing 2 mM l-glutamine, 10% heat-inactivated FCS, 100 U/ml penicillin, and 100 μg/ml streptomycin) and were allowed to grow to ∼50% confluence. Plasmid DNA (2 μg), pDEST26, or pDEST26-K296P was incubated in 100 μl of CMRL-1066 containing 2 mM l-glutamine, 100 U/ml penicillin, and 100 μg/ml streptomycin for 30 min at room temperature. Lipofectin (8 μg/ml) was added, and the mixture was incubated for an additional 15 min at room temperature, followed by the addition of 800 μl of CMRL-1066. The cells were washed once with CMRL-1066, followed by the addition of the DNA-lipofectin mixture. Following 24-h incubation at 37°C, the medium was replaced with DMEM, and the RAW 264.7 cells were cultured at 37°C for an additional 48 h. The cells were removed from growth flasks by treatment with 0.05% trypsin/0.02% EDTA, and transferred to T-25 flasks in DMEM containing 400 μg/ml G418 for selection of stably transfected cells. The cells were maintained in DMEM containing 200 μg/ml G418. Peritoneal exudate cells were isolated from PKR−/− and PKR+/+ mice by lavage as previously described (39). Following isolation, 4 × 105 cells in 400 μl of complete CMRL-1066 were incubated at 37°C under an atmosphere of 95% air 5% CO2 for 3 h. Cells were washed three times with complete CMRL-1066 to remove nonadherent cells before treatment with poly IC, EMCV, and IFN-γ as indicated in the figure legends. To control for potential strain differences, the effects of dsRNA and IFN-γ on iNOS expression and NO production were compared between macrophages isolated from C57BL/6 × 129 (The Jackson Laboratory, Bar Harbor, ME) and C57BL/6 mice, and no differences were observed (data not shown). RAW 264.7 cells were removed from growth flasks by treatment with 0.05% trypsin/0.02% EDTA at 37°C. Cells were washed twice with DMEM, plated at a density of 4 × 105 cells/400 μl of DMEM, and cultured for 2–3 h before initiation of experiments. RAW 264.7 cells and peritoneal exudate cells were infected for 18 h in complete CMRL-1066 at various multiplicities of infection (MOI) with replication-defective adenovirus expressing either β-galactosidase (Adβgal) or mutant super-repressor IκBα (AdIκBα) (40, 41). Following infection, cells were washed in PBS, fresh medium was added, and cells were treated as described in the figure legends. Nitrite formation was determined by mixing 50 μl of culture medium with 50 μl of Greiss reagent as described previously (42). The absorbance at 540 nm was measured, and nitrite concentrations were calculated from a sodium nitrite standard curve. PGE2 release was determined using a PGE2 enzyme immunosorbent assay according to the manufacturer’s specifications (Cayman Chemicals). Protein samples were separated by SDS-PAGE and transferred to nitrocellulose membranes (Amersham Pharmacia Biotech) under semidry transfer conditions as previously described (43, 44). Ab dilutions were: rabbit anti-mouse COX-2, 1/1000′ rabbit anti-mouse iNOS, 1/1000; and HRP-conjugated donkey anti-rabbit, 1/7000. Ag was detected by ECL according to the manufacturer’s specifications (Amersham Pharmacia Biotech). Total RNA was isolated from macrophages using the RNeasy RNA isolation kit (Qiagen, Chatsworth, CA). RNA (5–10 μg) was denatured, fractionated, and transferred to Duralon UV nylon membranes (Stratagene, La Jolla, CA) by capillary action in 20× SSC, 3 M NaCl, and 0.3 M sodium citrate (pH 7.0), and the membranes were hybridized to 32P-labeled probes specific for iNOS, COX-2, and cyclophilin. The DNA probes were radiolabeled with [α-32P]dCTP by random priming using the Prime-A-Gene nick translation system from Promega (Madison, WI). Cyclophilin was used as an internal RNA loading control. Hybridization and autoradiography were performed as described previously (10). Statistical comparisons were made between groups using one-way ANOVA. Significant differences between groups (p < 0.05) were determined by Bonferroni post hoc analysis. Previous studies have shown that the expressions of iNOS and COX-2 are coordinately regulated in response to a number of inflammatory mediators (35, 36, 37, 38). One activator of iNOS expression by macrophages is dsRNA (10), and consistent with the previously described coordinate regulation of COX-2 and iNOS expression, dsRNA stimulates COX-2 expression by RAW 264.7 cells (Fig. 1⇓). Treatment of RAW 264.7 cells with poly IC results in COX-2 mRNA accumulation following a 6-h incubation and COX-2 protein expression following a 24-h incubation (Fig. 1⇓, A and B). The stimulatory effects of poly IC on COX-2 expression are accompanied by an ∼10-fold increase in the accumulation of PGE2 in the culture medium of RAW 264.7 cells following a 24-h incubation (Fig. 1⇓C). The stimulatory actions of poly IC on COX-2 expression and PGE2 production are enhanced in the presence of IFN-γ, while IFN-γ alone stimulates low levels of COX-2 expression and PGE2 production by RAW 264.7 cells. These findings are consistent with the previously described stimulatory actions of poly IC on iNOS mRNA accumulation, protein expression, and nitrite production (10) and suggest that similar signaling pathways may regulate COX-2 and iNOS expression in macrophages. Effect of dsRNA and IFN-γ on COX-2 expression by RAW 264.7 cells. A, Total RNA was isolated from RAW 264.7 cells (5 × 106 cells/2 ml of DMEM) following a 6-h incubation with or without 50 μg/ml poly IC and/or 150 U/ml IFN-γ at 37°C, and COX-2 mRNA accumulation was determined by Northern blot analysis. Cyclophilin mRNA accumulation is shown as a loading control. COX-2 expression was determined by Western blot analysis (B), and PGE2 production was determined on cell culture supernatants by enzyme immunosorbent assay (C) following a 24-h incubation of RAW 264.7 cells (4 × 105 cells/400 μl of DMEM) with or without 50 μg/ml poly IC and/or 150 U/ml IFN-γ at 37°C. Results for COX-2 protein expression and mRNA accumulation are representative of three independent experiments, and results for PGE2 production are the average ± SEM of three independent experiments. Significantly different from untreated control: ∗, p < 0.05. The role of PKR in the regulation of dsRNA-induced COX-2 expression was examined using the dnPKR point mutant PKR-M1.1 (K196R) stably transfected into RAW 264.7 cells (RAW-PKR-M1.1). Incubation of RAW 264.7 cells stably expressing the empty vector pDEST26 (RAW-pDEST26) or RAW 264.7 cells expressing dnPKR (RAW-PKR-M1.1) with poly IC or poly IC plus IFN-γ for 6 h results in the accumulation of similar levels of COX-2 mRNA (Fig. 2⇓A). Following 24-h incubation, poly IC and poly IC plus IFN-γ stimulate similar levels of COX-2 protein expression and PGE2 production by RAW-pDEST26 and RAW-PKR-M1.1 cells (Fig. 2⇓, B and C). We have previously shown that dsRNA-induced iNOS expression is attenuated in RAW 264.7 cells expressing this dnPKR mutant, and that the inhibitory actions of dnPKR on iNOS expression can be overcome by the presence of IFN-γ (9). Consistent with these previous findings, poly IC-induced iNOS mRNA accumulation, iNOS protein expression, and nitrite production are attenuated in RAW-PKR-M1.1 cells (Fig. 2⇓). In addition, the inhibitory actions of dnPKR on iNOS expression and nitrite production are overcome by the presence of a second proinflammatory stimulus, IFN-γ. 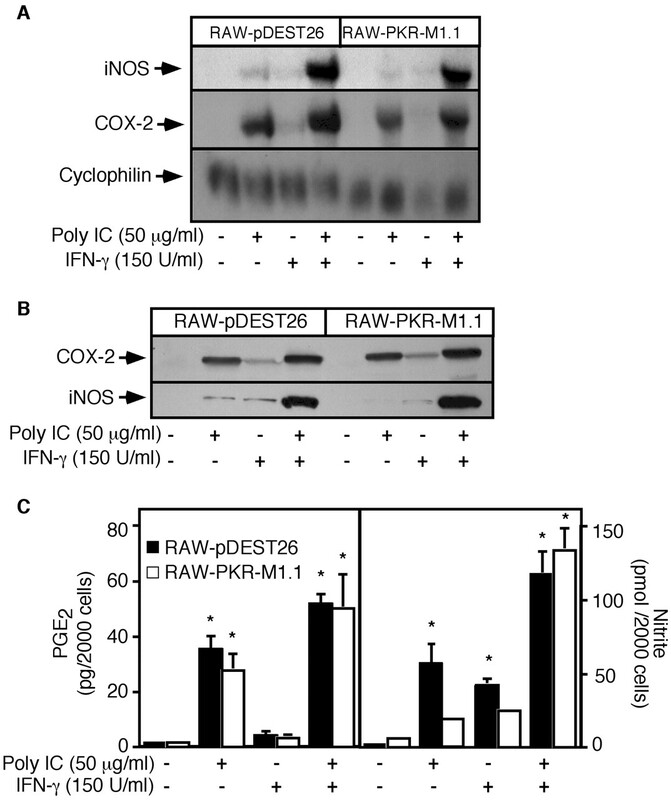 These findings suggest that dsRNA stimulates both COX-2 and iNOS expression; however, COX-2 expression in response to dsRNA appears to occur by a PKR-independent pathway, while the stimulation of RAW 264.7 cell iNOS expression by dsRNA is dependent on PKR, an effect that can be overcome by the presence of IFN-γ. Effect of dnPKR on dsRNA-induced iNOS and COX-2 expression by RAW 264.7 cells. A, Total RNA was isolated from RAW-pDEST26 (vector control) and RAW-PKR-M1.1 (dnPKR) cells (5 × 106 cells/2 ml of DMEM) following a 6-h incubation with or without 50 μg/ml poly IC and/or 150 U/ml IFN-γ at 37°C. The accumulation of iNOS and COX-2 mRNA was determined by Northern blot analysis. Cyclophilin mRNA accumulation is shown as a loading control. B, Following a 24-h incubation with poly IC and/or IFN-γ, COX-2, and iNOS expression were determined by Western blot analysis; C, nitrite and PGE2 production were determined on cell culture supernatants. Results for COX-2 and iNOS protein expression and mRNA accumulation are representative of three independent experiments and results for nitrite and PGE2 production are the average ± SEM of three independent experiments. Significantly different from untreated control: ∗, p < 0.05. Differences in the levels of poly IC-induced and poly IC- and IFN-γ-induced PGE2 accumulation between RAW-PKR-M1.1 and RAW pDEST26 cells were not statistically significant. To confirm that poly IC recapitulates the response of macrophages to a virus infection and to determine whether PKR is required for virus-induced COX-2 expression, the effects of EMCV infection on COX-2 expression by RAW 264.7 cells and RAW 264.7 cells expressing dnPKR were examined. Infection of RAW-pDEST26 cells for 24 h with EMCV stimulates COX-2 expression and the production of PGE2 (Fig. 3⇓, A and B). The stimulatory actions of EMCV on COX-2 expression and PGE2 production are slightly enhanced in the presence of IFN-γ. These findings are consistent with the stimulatory actions of poly IC on COX-2 expression by RAW 264.7 cells (Fig. 1⇑). 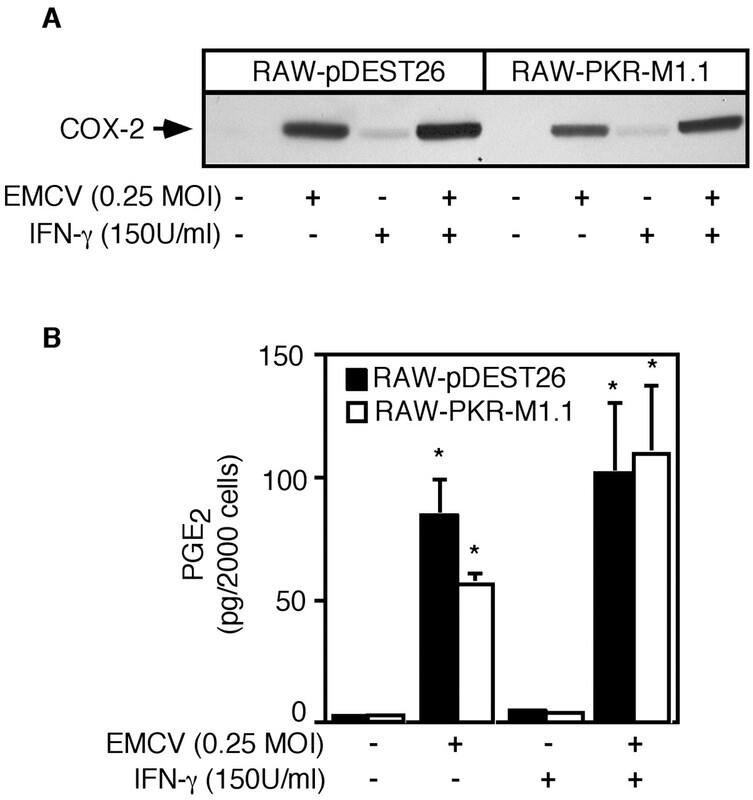 Importantly, EMCV and EMCV plus IFN-γ stimulate COX-2 expression and PGE2 production to similar levels in RAW-pDEST26 and RAW-PKR-M1.1 cells, indicating that PKR is not required for virus-induced COX-2 expression by macrophages. Effect of dnPKR on EMCV-induced COX-2 expression by RAW 264.7 cells. RAW-pDEST26 (vector control) and RAW-PKR-M1.1 (dnPKR) cells (4 × 105 cells/400 μl of DMEM) were infected for 24 h with or without 0.25 MOI EMCV and/or 150 U/ml IFN-γ at 37°C. A, COX-2 expression was determined by Western blot analysis, and PGE2 production was determined on cell culture supernatants by enzyme immunosorbent assay (B). Results for COX-2 protein expression are representative of three independent experiments, and PGE2 production is the average ± SEM of three independent experiments. Significantly different from untreated control: ∗, p < 0.05. Differences in the levels EMCV-induced and EMCV- plus IFN-γ-induced PGE2 accumulation between RAW-PKR-M1.1 and RAW pDEST26 cells were not statistically significant. To directly determine whether PKR is required for COX-2 expression, the effects of dsRNA and EMCV infection on COX-2 expression by macrophages isolated from PKR knockout mice were examined. In response to a 24-h treatment with poly IC, macrophages isolated from PKR−/− and PKR+/+ mice express COX-2 to similar levels and produce comparable levels of PGE2 (Fig. 4⇓, A and B). Alone, IFN-γ does not stimulate COX-2 expression or PGE2 production; however, IFN-γ enhances the expression of COX-2 and production of PGE2 by macrophages isolated from PKR−/− and PKR+/+ mice. Consistent with the effects of poly IC on COX-2 expression, EMCV infection stimulates COX-2 expression and PGE2 production to similar levels by macrophages isolated from PKR−/− and PKR+/+ mice (Fig. 4⇓, C and D). IFN-γ enhances the stimulatory actions of EMCV on COX-2 expression and PGE2 production, while IFN-γ alone fails to stimulate COX-2 expression or PGE2 production by mouse macrophages. These findings provide evidence that the presence of functional PKR is not required for poly IC- or EMCV-induced COX-2 expression by mouse macrophages. Effect of dsRNA and EMCV infection on COX-2 expression by macrophages isolated from PKR+/+ and PKR−/− mice. Peritoneal macrophages isolated from PKR+/+ and PKR−/− mice (4 × 105 cells/400 μl of DMEM) were incubated with or without 50 μg/ml poly IC and/or 150 U/ml IFN-γ (A and B) or infected with or without 0.25 MOI EMCV (C and D) for 24 h at 37°C. COX-2 expression was determined by Western blot analysis (A and C), and PGE2 production was determined on cell culture supernatants by enzyme immunosorbent assay (B and D). Results for COX-2 protein expression are representative of three independent experiments, and results for PGE2 production are the average ± SEM of three independent experiments. Significantly different from untreated control: ∗, p < 0.05. Differences in the levels of poly IC-, poly IC- plus IFN-γ-, EMCV-, and EMCV- plus IFN-γ-induced PGE2 accumulation between macrophages isolated from PKR−/− and PKR+/+ mice were not statistically significant. We have previously shown that dsRNA stimulates IκB degradation, NF-κB nuclear localization, and NF-κB reporter activity in RAW 264.7 cells, and that NF-κB activation is required for dsRNA-induced iNOS expression (10, 26). In addition, dsRNA stimulates NF-κB activation to similar levels in macrophages isolated from wild-type and PKR−/− mice and in RAW 264.7 cells and RAW 264.7 cells expressing dnPKR, indicating that the presence of PKR is not required for NF-κB activation (9). Using two structurally different inhibitors of NF-κB activation, the antioxidant pyrrolidine-dithiocarbamate (PDTC) and the proteasome inhibitor MG-132, the role of NF-κB activation in dsRNA-induced COX-2 expression was examined. As shown in Fig. 5⇓, the stimulatory actions of 24-h incubation of RAW 264.7 cells with dsRNA or dsRNA plus IFN-γ on COX-2 expression are prevented by both PDTC and MG-132 at concentrations that we have previously shown to inhibit NF-κB activation in RAW 264.7 cells (10). Consistent with the inhibition of COX-2 expression, both PDTC and MG-132 prevent poly IC-induced and poly IC- plus IFN-γ-induced PGE2 production by RAW 264.7 cells (Fig. 5⇓B). To confirm that NF-κB participates in the regulation of COX-2 expression, macrophages isolated from PKR−/− mice were infected with an adenovirus vector expressing an IκB super-repressor (AdIκBα). This construct contains the IκBα S32A/S36A mutation that prevents phosphorylation and subsequent degradation of IκB (40, 41). As shown in Fig. 5⇓C, EMCV- plus IFN-γ-induced COX-2 expression is significantly decreased in macrophages infected with AdIκBα compared with cells infected with control virus (Adβgal). Overexpression of AdIκBα also attenuates poly IC-stimulated and poly IC- plus IFN-γ-stimulated COX-2 expression by RAW 264.7 cells (data not shown). These findings provide direct evidence in support of a role for NF-κB in the regulation of dsRNA- and EMCV-stimulated COX-2 expression by macrophages. Effects of NF-κB inhibition on dsRNA-induced COX-2 expression in RAW 264.7 cells. RAW 264.7 cells (4 × 105 cells/400 μl of DMEM) were incubated for 24 h with or without 50 μg/ml poly IC and/or 150 U/ml IFN-γ in the presence and the absence of 100 μM PDTC or 25 μM MG-132. 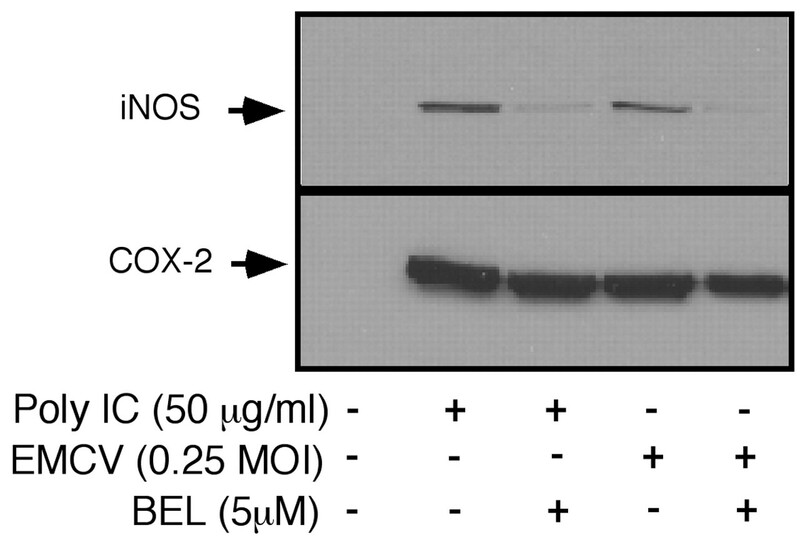 COX-2 expression was determined Western blot analysis (A), and PGE2 production was determined on cell culture supernatants by enzyme immunosorbent assay (B). Peritoneal macrophages were isolated from PKR−/− mice and infected with replication defective adenovirus vectors expressing β-gal (Adβgal) or super-repressor IκB (AdIκB) at 10 MOI for 18 h, followed by infection with EMCV and IFN-γ. Following 24-h incubation, the macrophages were isolated, and COX-2 expression was determined by Western blot analysis (C). Results for COX-2 protein expression are representative of three independent experiments; results for PGE2 production are the average ± SEM of three independent experiments. Recently, we have shown that dsRNA activates iPLA2, and that BEL, a suicide substrate inhibitor of iPLA2, prevents dsRNA- and EMCV-induced iNOS expression by RAW 264.7 cells (26). Importantly, dsRNA stimulates iPLA2 activity in macrophages isolated from wild-type and PKR−/− mice, suggesting that PKR is not required for dsRNA-induced iPLA2 activation (26). To determine whether iPLA2 participates in the regulation of COX-2 expression by macrophages, the effects of BEL on poly IC-induced COX-2 expression were examined by Western blot analysis. Consistent with our previous studies, iNOS expression, stimulated by 24-h incubation of RAW 264.7 cells with dsRNA, is prevented by BEL (Fig. 6⇓). In contrast, BEL does not inhibit dsRNA-induced COX-2 expression by RAW 264.7 cells. In addition, BEL does not attenuate the stimulatory actions of EMCV infection on COX-2 expression by RAW 264.7 cells. These findings suggest that the activation of iPLA2 is not required for dsRNA- or EMCV-induced COX-2 expression, a finding that is in contrast to the requirement for iPLA2 activation in the regulation of iNOS expression in response to poly IC and virus infection. Effects of BEL on EMCV-induced COX-2 expression in RAW 264.7 cells. RAW 264.7 cells (4 × 105 cells/400 μl of DMEM) pretreated for 30 min with 5 μM BEL were infected with or without 0.25 MOI EMCV or treated with 50 μg/ml poly IC. Following a 24-h incubation, the cells were isolated, and COX-2 and iNOS expressions were determined by Western blot analysis. Results are representative of three independent experiments. In this study the mechanisms by which dsRNA and virus infection stimulate the expression of COX-2 by macrophages were examined. Previous reports have shown that the expression of COX-2 is stimulated during a viral infection (29, 30, 31, 32); however, the signaling pathways that participate in this increased expression of COX-2 by macrophages have yet to be determined. PKR is believed to play a primary role in the regulation of new gene expression in virally infected cells as well as in cells treated with dsRNA (1). We have identified a role for PKR in the regulation of iNOS expression by RAW 264.7 macrophages, as dominant negative mutants of PKR have been shown to prevent dsRNA-induced iNOS expression (9). This dependence on PKR for iNOS expression can be overcome by an additional proinflammatory signal, IFN-γ (9). In addition, PKR is believed to participate in the activation of NF-κB, as dsRNA-stimulated DNA binding activity of NF-κB is attenuated in PKR-deficient mouse embryonic fibroblasts compared with wild-type control cells (13, 14, 15). While PKR appears to participate in dsRNA-induced iNOS expression by RAW 264.7 cells, PKR is not required for the activation of NF-κB in these cells. We have shown that dsRNA stimulates NF-κB nuclear localization and DNA binding activity as well as IκB degradation to similar levels in RAW 264.7 cells and RAW 264.7 cells expressing dnPKR (9). In the current study we provide evidence that PKR is also not required for dsRNA-stimulated COX-2 expression by RAW 264.7 cells. Treatment of RAW 264.7 cells or RAW 264.7 cells expressing dnPKR with dsRNA results in similar levels of COX-2 mRNA accumulation, protein expression, and PGE2 accumulation. Furthermore, EMCV stimulates COX-2 expression and PGE2 accumulation to similar levels in RAW 264.7 cells and RAW 264.7 cells expressing dnPKR. In contrast, dsRNA-stimulated iNOS expression and NO production are significantly attenuated in RAW 264.7 cells expressing dnPKR. These findings indicate that while dsRNA stimulates the coexpression of iNOS and COX-2 by RAW 264.7 cells, the regulation of iNOS expression is dependent on PKR, while COX-2 is expressed in a PKR-independent fashion. In primary mouse macrophages a combination of at least two inflammatory signals is required for iNOS expression (22). We have shown that dsRNA in combination with IFN-γ stimulates iNOS expression and nitrite production to similar levels in macrophages isolated from PKR−/− and PKR+/+ mice (9, 26). In this study PKR−/− mice were used to show that the presence of PKR is not required for macrophage COX-2 expression in response to either poly IC or EMCV infection. 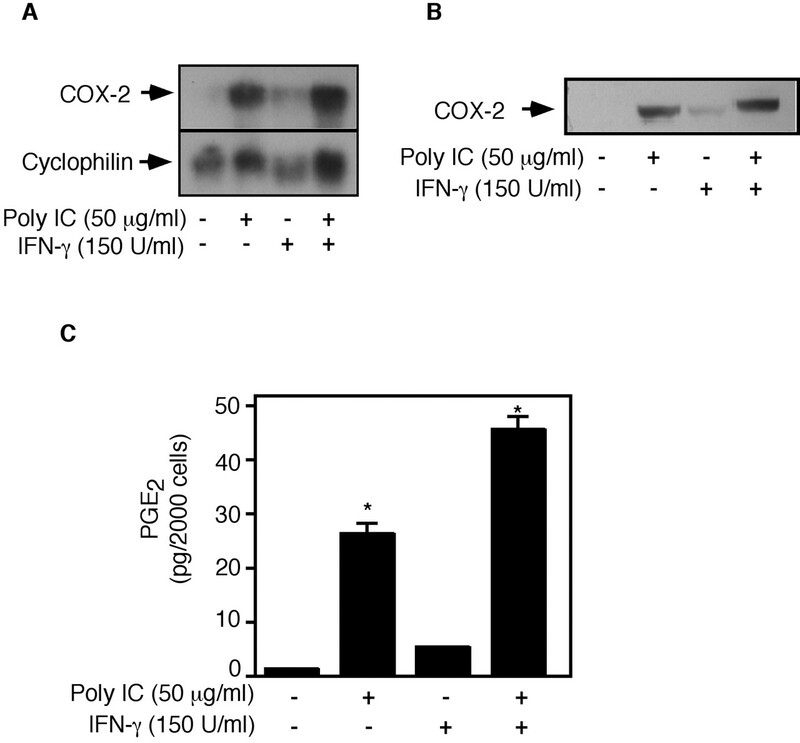 In addition, COX-2 expression by primary mouse macrophages does not require two proinflammatory signals, as poly IC alone stimulates COX-2 expression, although the level of expression is enhanced by IFN-γ. 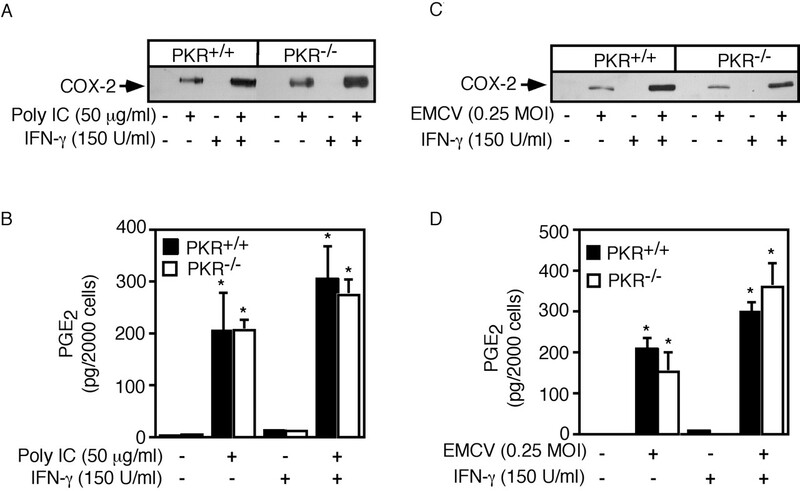 In a similar fashion, EMCV stimulates the PKR-independent expression of COX-2 by murine macrophages, and the levels of expression are also enhanced by IFN-γ. IFN-γ alone does not stimulate COX-2 expression by primary mouse macrophages. These findings indicate that the presence of PKR is not required for COX-2 expression by either RAW 264.7 cells or primary mouse macrophages. Recently, we have identified a role for iPLA2 in the selective regulation of inflammatory gene expression in macrophages (26). The iPLA2 suicide substrate inhibitor BEL prevents dsRNA- and EMCV-induced iNOS expression by RAW 264.7 cells and mouse macrophages. The concentration-dependent inhibition of iNOS expression by BEL is consistent with the concentration-dependent inhibition of dsRNA-stimulated iPLA2 activity in RAW 264.7 cells. Also, BEL does not attenuate the activation of NF-κB by dsRNA in macrophages, indicating that the actions of iPLA2 are not mediated by inhibition of this transcriptional regulator (26). The iPLA2 appears to mediate dsRNA and EMCV-induced iNOS expression by activation of PKA and subsequent activation of CREB as evidenced by the following findings: 1) inhibitors of PKA prevent dsRNA-induced iNOS expression; 2) dsRNA stimulates CREB phosphorylation in a BEL-sensitive fashion; and 3) mutations in the CREB binding elements in the iNOS promoter attenuate dsRNA-stimulated iNOS reporter activity (26). While iPLA2 appears to participate in the regulation of iNOS expression, the iPLA2 inhibitor BEL fails to modulate dsRNA- or EMCV-induced COX-2 expression by macrophages. These findings provide further evidence in support of a selective role for iPLA2 in the regulation of macrophage proinflammatory gene expression in response to dsRNA and virus infection, as iNOS expression appears to be dependent on iPLA2 activation, while dsRNA- and EMCV-induced COX-2 expression (this study) and IL-1 expression (26) appear to occur by iPLA2-independent mechanisms. While iPLA2 and PKR do not appear to participate in the regulation of COX-2 expression by macrophages, inhibition of NF-κB activation using the antioxidant PDTC, the proteasome inhibitor MG-132, or IκB super-repressor expression prevents dsRNA- and EMCV-induced COX-2 expression by RAW 264.7 cells and mouse macrophages. Importantly, we have previously shown that PKR is not required for the activation of NF-κB (9), and that inhibitors of iPLA2 do not modulate NF-κB activation in RAW 264.7 cells (26). In addition, we have shown that PDTC and MG-132 attenuate dsRNA-stimulated NF-κB nuclear localization and DNA binding as well as IκB degradation in RAW 264.7 cells (9, 10). NF-κB has been implicated in the regulation of macrophage COX-2 expression in response to PKC activators such as phorbol esters and in response to endotoxin (45, 46). Our findings are consistent with these previous studies and identify NF-κB as a primary regulator of COX-2 expression by macrophages in response to dsRNA or viral infection. The regulation of NF-κB activation and COX-2 expression in macrophages following dsRNA treatment or viral infection does not appear to occur by mechanisms that require the presence of PKR, nor do they require iPLA2 activation. It is possible that the mechanism by which dsRNA and viral infection stimulate NF-κB activation may be associated with TLR3 receptor signaling, as this receptor has recently been identified as the dsRNA receptor (47), and we have shown that macrophages express the TLR3 receptor (J. M. Moran and J. A. Corbett, unpublished observation). Currently, we are examining the potential role of TLR3 receptor signaling in the regulation of NF-κB activation and proinflammatory gene expression in macrophages in response to dsRNA and viral infection. We thank Colleen Kelly Bratcher for expert technical assistance. We also thank Dr. Randal Kaufman for providing PKR-deficient mice, and Ji-Won Yoon for the generous gift of EMCV. ↵3 Abbreviations used in this paper: PKR, dsRNA-dependent protein kinase; BEL, bromoenol lactone; COX-2, cyclooxygenase-2; dn, dominant negative; iPLA2, calcium-independent phospholipase A2; EMCV, encephalomyocarditis virus; IκB, inhibitory protein κB; IKK, IκB kinase; iNOS, inducible NO synthase; IRF-1, IFN regulatory factor-1; MOI, multiplicity of infection; poly IC, polyinosinic-polycytidylic acid; PDTC, pyrrolidine-dithiocarbamate. Williams, B. R. 2001. Signal integration via PKR. Sci. STKE 2001:RE2. Hovanessian, A.. 1993. Interferon-induced and double-stranded RNA-activated proteins as key enzymes regulating protein synthesis. J. Ilan, Jr, ed. Translational Regulation of Gene Expression 163 Plenum Press, New York. Hibbs, J. B., Jr, T. R. Vavrin, Z. Granger, D. L. Drapier, J. C. Amber, J. R. Lancaster, Jr. 1990. Synthesis of nitric oxide from a terminal guanidino nitrogen atom of L-arginine: a molecular mechanism regulating cellular proliferation that targets intracellular iron. H. E. Moncada, Jr, ed. Nitric Oxide from l-Arginine: A Bioregulatory System 189 Elsevier Science, New York.